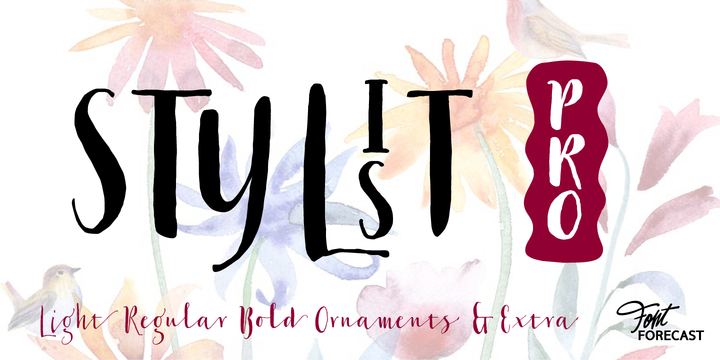 Stylist Pro is an hand drawn typeface created by Hanneke Classen and published by Fontforecast which is available in 5 styles ideal for greeting cards, logo, magazine, invitations, packaging, romantic projects. You can use stylistic tricks. It has swash, contestual alternates, stylistic sets, Upper Case and Lower Case, combining them you can have beautiful results. Use Caps + standard ligatures to activale interlocking pairs or Caps + discretionary ligatures to have vertical combinations. Ornaments include matching seamless titles. Also it has multilingual support. Enjoy! A font description published on Friday, June 26th, 2015 in Fontforecast, Fonts, Hanneke Classen by Alexandra that has 5,831 views.